Warm earth tones are typical for stained concrete. 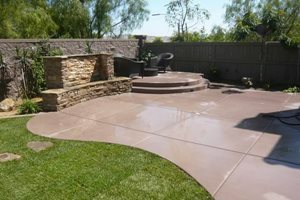 Concrete staining is a popular way to turn plain gray concrete into almost any color imaginable and completely change the look and feel of your outdoor space. 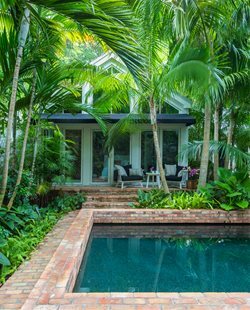 Popular applications for concrete staining include walkways, patios, pool decks, driveways, and even walls. In fact, nearly any bare concrete surface can be stained. 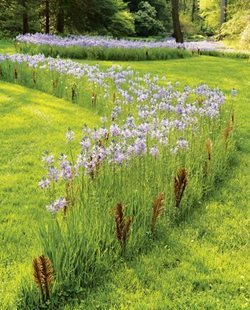 Beautiful, rich, earth-tone colors can be achieved by using acid-based chemical stains. Because of the chemical reaction that takes place between the stain and the concrete, unique marbeling and variegated effects are possible. For an ever broader array of color options, newer water-based acrylic stains for concrete are now available. These stains produce more uniform color effects and are easier to apply. Here is an overview of the advantages, as well as the limitations, of concrete staining and ideas for using stain to enhance your outdoor concrete. —Numerous colors of stain are available to give you the flexibility to coordinate the color of your concrete with your landscape. 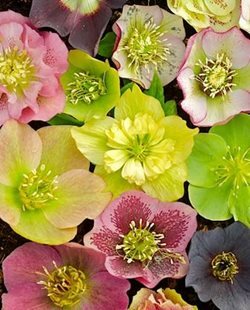 It’s also possible to combine colors to create a unique look. 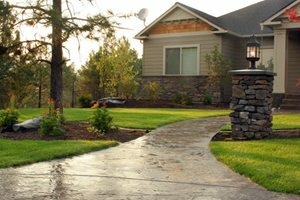 —Staining existing concrete is an economical way to transform the look of your space without the cost of investing in a new pavement. —Stained concrete requires minimal upkeep and is as easy to maintain as a standard slab of concrete. Typically, cleaning and resealing of stained concrete every couple of years will keep it looking its best. 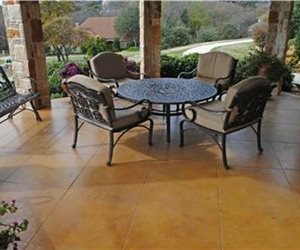 —Stained concrete is extremely durable and can withstand weather extremes and heavy traffic. Because the color penetrates the concrete, it will not wear away. Can Your Concrete be Stained? Both new and existing concrete is a candidate for staining. New concrete is poured, allowed to cure for the necessary number of days and then stained. Existing concrete requires that the surface be prepared, which may require grinding or a chemical treatment to ensure that the stain will take. No matter how old your concrete is, it is important to make sure the stains used will not be compromised by UV rays. 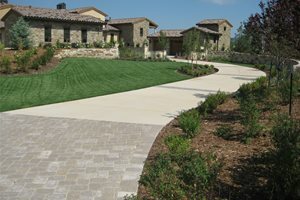 Often a special sealer is required to prevent fading, think of it as sunblock for your concrete. If your concrete has structural problems such as cracks, a contractor may suggest resurfacing. Resurfacing is a process in which a cement-based topping is applied over the damaged concrete to provide a smooth, crack free surface. This new surface can then be colored with the stains of your choice. 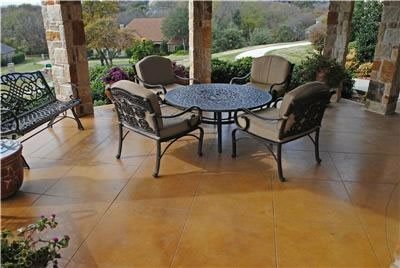 Staining is a great option for many outdoor slabs, but not all concrete is a good candidate for staining. Stains will not hide flaws in concrete, and may even draw attention to existing cracks and discoloration. Concrete that has been previously sealed or coated also shouldn’t be stained, since the stain needs to penetrate the slab to impart color. Staining concrete requires skill and should be done by someone who knows what they are doing. The application of stain is often done in multiple stages and can take a significant amount of time. Also, the porosity and condition of the concrete can affect the final color, so it’s important to test the stain on the concrete you will be treating.